Savonix, the company that has revolutionized access to brain data, today announced the global launch of its clinically valid, digital cognitive assessment – Savonix MobileTM. The neurocognitive assessment is accessible via healthcare providers on any mobile device, eliminating the need for time-consuming and expensive pen-and-paper exams to screen for cognitive function. The solution — which expands the utility of cognitive data in critical ways — delivers usable, scalable data for brain function in domains such as working memory, executive function and impulse control. Savonix was formed to build an affordable and accessible tool for cognitive testing. The company has created a way for providers, payers and patients to easily incorporate cognitive data in treatment planning and decisions at a fraction of the cost of traditional legacy testing. Beyond digitizing gold standard cognitive tests, Savonix solves a critical piece of the patient care continuum. Studies have shown that cognition is a major predictor of outcomes in disorders as varied as depression, diabetes and Chronic Obstructive Pulmonary Disease (COPD). 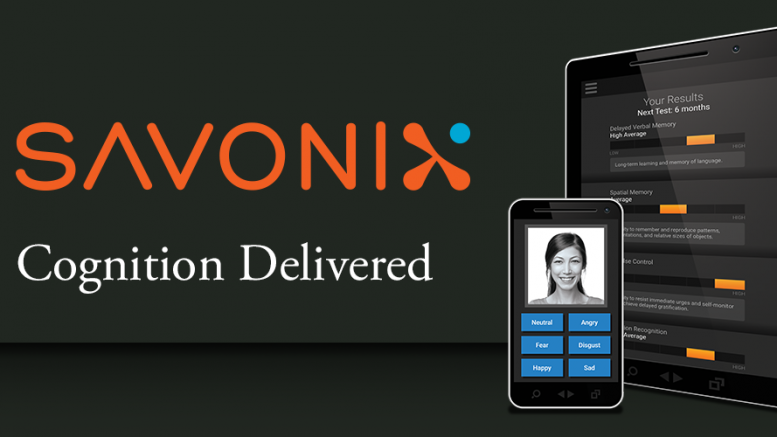 Officially launched in October of 2016, Savonix Mobile delivers healthcare providers a cost-effective and highly accessibly cognitive tool that captures the range of cognitive function from slight impairment to gross decline. Access to data in this wide range is particularly useful in Health Risk Assessments as current tools that operate without a neuropsychologist capture only gross impairment; however, data shows that even mild impairment impacts treatment outcome in a variety of diseases. For instance, in diabetes mild cognitive impairment has been proven to negatively impact self-care in patients, from insulin-dosing skills to self-monitoring of blood sugar levels. Using data from Savonix Mobile, clinicians can predict this type of behavior and build better treatment plans that dramatically affect the health outcomes of the patient. In clinical trials a digital assessment of cognitive function reduces participant burden, eliminates the risk of missing or incorrect data and is a reliable outcome measure where cognition is a primary concern in the research. Savonix delivers a more complete solution – without the expense of rater training and risk of human error – with a sophisticated dashboard that instantly transforms test results into usable data. Current license holders with Savonix include Fitango Health, NYU and CUNY. The Savonix mobile assessment is now available internationally via healthcare licenses and third-party partnerships.